The first time I read The Lord of the Rings, I was about fourteen. The movie had just come out, and after watching it seven times in a row, I realized I should probably tackle the book at some point. To my horror, I discovered the book took what felt like absolute ages to get to the bits I thought of as “the good bits.” I was in love with Strider, full of the passion only a teenage crush can inspire, and all I wanted in the world was to get to the part where the Hobbits meet him. 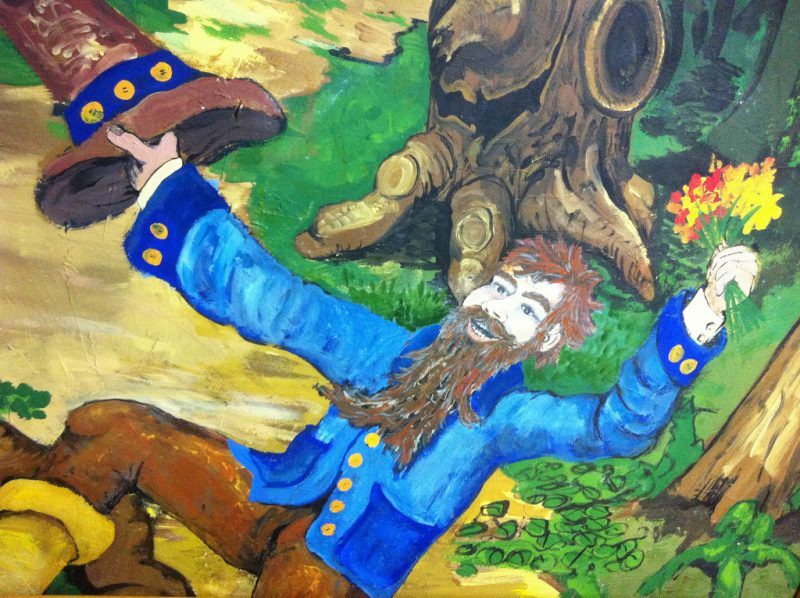 Tom Bombadil is a horrible thing to encounter under those circumstances. I hated him, from his stupid feathered hat to his yellow boots. He was embarrassing, and creepy, and it felt like the chapters with him would never end. His poetry drove me to the point of wanting to commit murder, and I was absolutely certain that his beautiful young wife was not with him through her own choice. The Lord of the Rings again. This time, I thought, maybe Tom Bombadil won’t be so bad. people, and forces them to call him master. ‘No indeed!’ she answered, and her smile faded. ‘That would indeed be a burden,’ she added in a low voice, as if to herself. Couple this with the fact that Goldberry is supermodel material while Tom is described to have the face of a wrinkled red apple, along with the fact that Tom’s backstory reveals he ‘captured’ her, and you will see that this ‘romance’ of Tom’s has turned into a horror story. Right, so the most this ‘water’ does is loosen the Hobbits’ tongues a bit and maybe make them sing a little. Harmless, right? And, most significantly, the Hobbits’ will seems to have all but disappeared. In fact, Frodo will say or do practically anything Tom wants him to. Now, I don’t know about you, but if I was staying at someone’s house, and they kept telling me to “ignore the noises you hear tonight,” I’d be a little concerned. Notice how Pippen repeats the mantra to himself? Almost like he’s been brainwashed? What happened that night? Did the Hobbits really just have bad dreams, or did they witness something unspeakable, something so dark, that Tom had to carefully drug and brainwash them into forgetting, leaving only a feeling that they’d had bad dreams behind? I mean, it’s no wonder. It couldn’t be more cringe-worthy and embarrassing if he tried. He even talks about himself in the third person. But what if the poetry was never meant to be good? What if it’s only meant to break through the mind’s defenses and turn any brain into jelly, leaving any listener so utterly defenseless that Tom can then invade their minds and control them? Picture it. Your host, who talks about himself in the third person, and who keeps saying “Hey merry dol, derry dol” like it’s not the most instantly annoying phrase anyone has ever heard, not only makes you listen while he drones on and on, but he actually gets up and dances about every now and then. What are the chances of anyone willingly spending time with this person? Laura Shortridge is a bleeding heart liberal and secular feminist who spends far too much time thinking seriously about trivial things. Find her on Twitter @DiscordianKitty. While I like Tom Bombadil, I confess that I prefer Tim Benzedrine’s poetry.